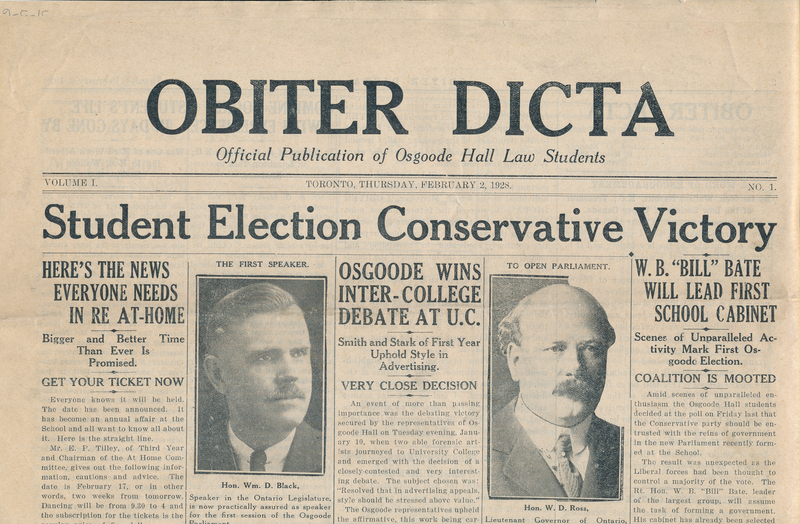 The student newspaper Obiter Dicta was founded in 1928 when the law school's home was still at Osgoode Hall. Obiter Dicta's first editors hoped that with its inaugural issue of Feb. 2nd, "one more great step has been taken towards the development and ultimate realization, within our school of a distinctively "Osgoode Spirit" . Obiter Dicta is a Latin phrase meaning "passing remarks." The newspaper covered material of interest to law students: articles about politics, law and legal education predominated, but the social side of law school was also well-represented with coverage of debates, social events, guest lectures, and sports. The first issue reported on student elections, an inter-college debate the Osgoode team won, and a "delightful talk" on the Tariff Advisory Board. Also reported on was a luncheon address by a "prominent criminal lawyer of this city," who declared, "Never aggressively cross-examine a woman - certainly not while she is in the witness-box". Prominently displayed on the front page was a notice concerning the upcoming annual dance (the At Home) at which Romanelli's twelve-piece orchestra was scheduled to supply the music. Students were urged to take precautions to prevent gate-crashers. Over the years the paper continued to provide news and a forum for comments about politics and legal education. Disgruntled law students used the paper to express their criticisms: in Jan. 1933 the headline read, "Wasting three Years at Osgoode." Of particular interest were issues touching on legal education. A 1939 headline questioned the articling system in language very similar to recent debates on the issue. In addition to news, Obiter Dicta contained a range of advertisements for all types of products and services that might appeal to fledgling lawyers: stenographers, jewelers, stationers, photographers, caterers, legal publishers, and business who sold sporting goods, clothing and shoes, even pianos. By the 1960s, law firms had taken over as the main advertisers. After the law school moved from Osgoode Hall to York University in 1968, law students continued to publish the newspaper there. Although its character has changed over the years, it still covers the political, educational and social side of law school. Note on Sources: The Law Society of Upper Canada Archives contains an incomplete collection of Obiter Dicta from 1928 to 1967, and a more complete collection of later issues.